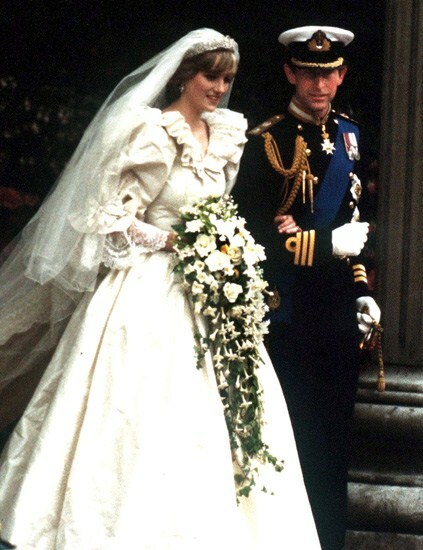 Do you remember Princess Diana's wedding dress? How about the most recent royal bride, Kate Middleton? Or the fictional fashionista Carrie Bradshaw's 'Big' wedding day outfit? High-profile weddings are characterized by high-profile dresses. These gowns take months to design and come with quite the price tag, but there's no denying that the end result is something priceless. Two billion people reportedly turned on their tubes to catch the royal wedding last April and the most buzzed about topic leading up to the big day was Kate Middleton's wedding attire. The trendsetting gown that she wore on her walk down the aisle was designed by Sarah Burton for Alexander McQueen and made from French Chantilly lace, English Cluny lace and ivory and white satin gazar. The dress was made to resemble an opening flower and design details included individual hand-cut flowers decorating the bodice and train. Fun fact: Kate's train was a mere nine feet compared to Princess Di's 25-footer. 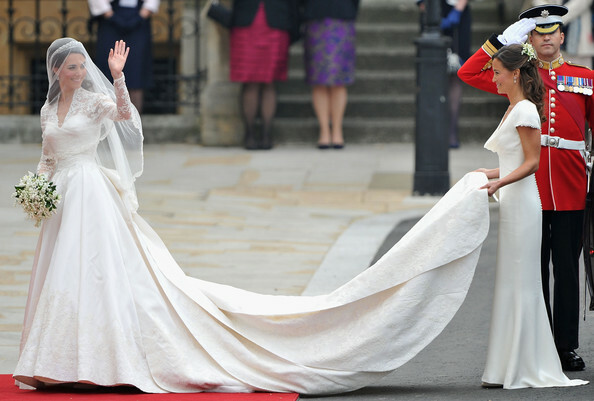 "It has been the experience of a lifetime to work with Catherine Middleton to create her wedding dress, and I have enjoyed every moment of it," Sarah Burton said in a statement. "It was such an incredible honour to be asked, and I am so proud of what we and the Alexander McQueen team have created. I am delighted that the dress represents the best of British craftsmanship." Kristen Stewart as Bella in "Twilight: Breaking Dawn"
Bella Swan's marriage to Edward Cullen was one of the most highly-anticipated weddings in teen fiction, and the Carolina Herrera creation worn by her movie counterpart was pretty anticipated as well. Valued at $35,000, the custom-made dress took four months to create and was paired with jewel-encrusted Manolo Blahnik heels. "We did three fittings. When she initially put on the dress and looked over her shoulder into the mirror, she was very moved. In that moment she was not an actress or a character in a film but instead a bride, and a happy one at that. The designer not only worked with the actress for a perfect fit, but with Twilight author Stephenie Meyer to create the perfect style for Bella. The dress is simple in the front, with a gorgeous oval-shaped low back and lace embellishments. "It’s very romantic, and when all the details come together, it creates a vision specific to Bella’s style and personality," said Herrera. 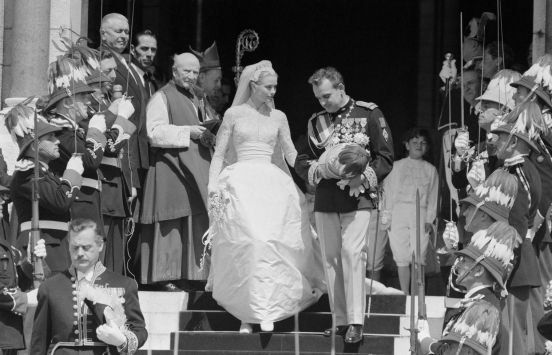 She might not have been born into royalty, but Grace Kelly's very public marriage to Prince Rainier III of Monoco was not without an incredibly crafted wedding gown fit for a princess. The long sleeved dress was designed by Helen Rose, famous for designing costumes for MGM, and featured a high rounded collar and fitted waist. With antique lace from Brussels embroidered with pearls, the construction of Grace Kelly's extravagant dress took six weeks and 36 seamstresses! Another highly anticipated fictional marriage: Carrie Bradshaw's marriage to Mr. Big. And although our favorite fashionista didn't quite manage to make it down the aisle in her Vivienne Westwood wedding dress, it sure caught our hearts. The champagne colored dress featured a full skirt and asymmetric hem, as well as a unique sweetheart neckline. Although the cocktail version of Carrie's Vivienne Westwood dress sold out online immediately for $9,875, fans can still buy the floor length version directly from Vivienne herself for a mere $15,700. "Our wedding dress always captures the essence of the collection to its most extreme and is the highlight piece," a spokesperson for Vivienne Westwood told Vogue. "In the film, Carrie was sent many choices, however, the dress designed by Vivienne Westwood obviously stood out amongst others and became her choice for her wedding." In 1981, Princess Diana married Prince Charles in an historic ceremony, wearing an ivory silk dress designed by Elizabeth Emmanuel. Elizabeth said of Diana to Piers Morgan, "She never seemed to be under pressure. She was always very relaxed and I was the one who was getting stressed out." Despite the 80s puff sleeves, her wedding gown was beautifully crafted and with antique lace and a whopping 10,000 mother-of-pearl sequins! While Princess Di's dress is currently on tour, the replica gown (made in case of any snafus) was just sold at an auction for approximately $130,000.